What Are the Causes of Breakthrough Bleeding While on Birth Control Pills? 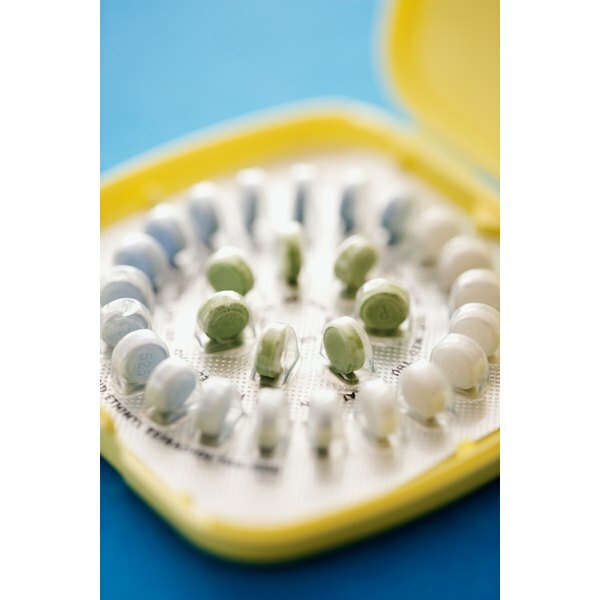 Do Birth Control Pills Increase or Decrease Estrogen Levels? Birth control pills use synthetic hormones to prevent pregnancies. Synthetic versions of estrogen and progesterone often work together to not only prevent ovulation, but also create undesirable for conditions for fertilized egg implantation. You may question whether or not these man-made hormones actually increase or decrease estrogen levels in the body. Depending on your current needs, this information is necessary when deciding which type of contraception to use. There are many variations of the birth control pill on the market today. There are pills that have a constant low dose of estrogen. There are very low-dose, having 20 mcg of estrogen. The next level of low dose typically contains about 33 mcg of estrogen. There are also high dose estrogen pills, which contain 50 mcg of estrogen per pill. Then there are phasic pills that have a different amount of estrogen throughout the cycle, which more closely mimics the body's natural cycle. Other birth control pills, however, use no estrogen and merely depend on progesterone to prevent pregnancy. A normal ovulation cycle begins with follicle stimulating hormones, which stimulate the egg follicle. Then, this follicle sac secretes estrogen to prepare the uterine lining to host a fertilized egg. Once estrogen peaks, the follicle stimulating hormone ceases and another hormone surges, the luteinizing hormone. This is the hormone that tells the body to release an egg because the uterus is ready. After ovulation, the corpus luteum tissue forms in the uterus, which secretes progesterone a little more each day. This progesterone prevents any more egg sac stimulation or release until it knows whether or not there is a pregnancy. It also suppresses natural estrogen production. The birth control pills with artificial estrogen prevent natural estrogen production. This prevents the spiking that leads to uterine lining preparation. Birth control pills also maintain a high level of progesterone to prevent ovulation in general. Whether or not birth control pills increase or decrease your estrogen levels completely depends on timing. If you are a woman of reproductive age who has a healthy hormonal system able to produce estrogen, the pill will decrease your estrogen. Elmhurst.edu shows a graph of the spikes in estrogen throughout a woman's cycle. During ovulation, estrogen peaks at about 300 pg/ml. High-dose birth control pills, however, keep levels no higher than 50 mcg according to WebMD. Perimenopausal women, however, can increase their estrogen by taking birth control pills because they no longer cycle and produce as much of the hormone naturally. Although birth control pills containing estrogen and progesterone are designed to regulate hormones and prevent sudden surges, small surges happen each day. Every time you take the pill, the body suddenly processes the hormones creating small peaks. Some women very sensitive to these may experience nausea and headaches. WebMD states that the low-dose pills with less estrogen are just as effective as high-dose pills. The difference comes if you forget a dose. Low dose pills are less effective than high-dose if you forget a day. Does Breastfeeding Cause Low Progesterone? How Is Your Period Different When You're Pregnant?